Slovenian based company EK Water Blocks has been in the water cooling business for a while now, but this is the first time it has turned its attention to Solid State Drives. 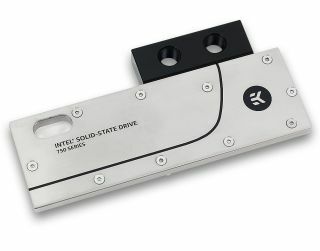 The EK-FC I750 SSD is a full cover water block for the PCIe Intel SSD 750 series. The I750 has been designed in conjunction with Intel, and as such the water block has a very similar design to the 750 series’ stock cooler, which it's designed to replace. It also ensures the entire PCB is covered for optimal cooling performance. The I750 has a high flow design, which means it can be used in systems with weaker water pumps. The base is made of nickel-plated electrolytic copper, and the top cover is made of stainless steel. Screw-in brass standoffs come pre-installed. An addition EK-FC terminal comes with the water block, which has two G1/4-inch threaded ports on the side. This means that if your system doesn’t have enough space for side mounted ports, you’ll be able to use ports on the top edge instead. The EK-FC I750 SSD is available via the EKWB website, where it has a listed price of €90 / $100, or through partners.